Long thought to have been the source of the El Dorado legend, and home of what was once the largest open-pit gold mine in South America, Guyana is quickly becoming a pioneer in wildlife conservation and ecotourism in South America. Birding trips near the capital of Georgetown can lead to the sighting of more than 50 varieties of birds in just an hour or two. The Kanuku Mountain sanctuary, inland, is home to more than three hundred fifty bird species, and the country as a whole is home to over eight hundred bird species. Well over two hundred mammal species, many of them unique, populate the three climate zones–forest, savannah, and coastal. To prevent the loss of habitats for these birds and mammals, some areas of the country are now under government protection, especially in the Kanuku Mountains and in the northernmost beach areas which serve as breeding grounds for several rare turtle species. 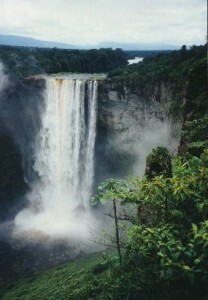 One of the reasons that ecotourism is being promoted is that Guyana, unlike Venezuela and other Caribbean-facing countries, has no white sand beaches, eliminating the possibility of large-scale beach resort development, though its placid rivers and rich flora and fauna have recently made it a fascinating cruising destination for small boat owners. Its nearly three hundred unique flowering plants and over five hundred species of orchids are unparalleled in beauty. First inhabited twelve thousand years ago by people who arrived from Mongolia, Guyana became the home of their descendants, the Amerindians, a culture which remained intact until the arrival of Spanish explorers in the sixteenth century, followed by African slaves brought in to work in the sugar industry, and later the Portuguese, French, Indian, Chinese, Dutch, and British colonizers and settlers, all of whom contributed to a melting pot culture. Independent from the British since 1966, Guyana is the only English-speaking country in South America, “a land of contradictions and superlatives” boasting, among other features, the tallest wooden building in the world, the highest single-drop waterfall, the world’s largest freshwater fish, the largest undeveloped rainforest left in the world, the world’s largest spider–a bird-eating spider with an eleven inch leg span–and the world’s largest bat–with a one-meter wing span! 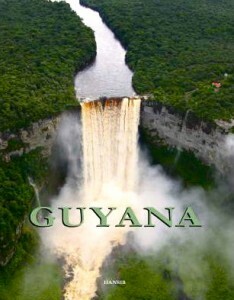 Gorgeous photographs accompany the fascinating history of Guyana in this well-written text, which dramatically illustrates the country’s potential for growth, along with its need for better infrastructure. The country has some problems in and around the cities with unemployment, underemployment, and the underdevelopment of major industries there, and the government recognizes these need to be addressed. In the countryside, however, agriculture is already a major industry, and freshwater aquaculture and ecotourism could become major industries there. 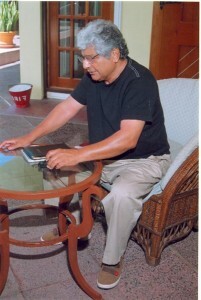 The Guyanese people, are energetic, culturally diverse, and forward-thinking, and they are already making strides toward protecting their immense natural resources and preserving the environment, while still developing viable and self-sustaining industries that benefit the entire nation. Hats off to Guyana!